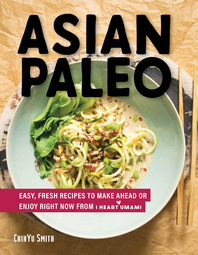 Asian Paleo - Description | W. W. Norton & Company Ltd.
Easy Asian Paleo will inspire you. In Easy Asian Paleo, with 75 recipes inspired by her childhood in Taiwan and favourite dishes from China, Japan, Thailand, Vietnam and beyond, ChihYu Smith knows how to satisfy cravings in a hearty, healthy Paleo way. She includes easy meals, fun and festive weekend options, batch cooking, sides and sauces. The reader will want to try them all, including: Kung Pao Chicken, Sichuan Dry-Fried Green Beans with Crispy Pork and Zucchini Dan Dan Noodles. There are also plans with shopping lists and make-ahead instructions. Smith’s tips and tricks for recipes filled with a variety of fresh vegetables and lean meats make Asian cooking totally, deliciously Paleo.